Beth Bernobich comes from a family of storytellers, artists and engineers. She juggles her time between working with computer software, writing, family, and karate. Her bibliography includes the short story collection, A Handful of Pearls & Other Stories (Lethe Press), the Ars Memoriae novella (PS Publishing), and numerous short stories that have appeared in publications such as Asimov’s, Interzone, Postscripts, and Strange Horizons. Read an excerpt of her first novel, Passion Play, at Beth Bernobich’s website. River of Souls (Erythandra) — (2010-2015) Publisher: The daughter of one of Melnek’s more prominent merchants, Ilse Zhalina has lived most of her life surrounded by the trappings of wealth and privilege. She has wanted for nothing and many would consider her lot a most happy one. But there are dark secrets even in the best of families and Isle and the women in her family have learned that to be beautiful and silent is the best way to survive. However, when Ilse fianlly meets the colleague of her father’s selected to marry her, she realizes that this man would lock in her a gilded cage. In her soul, she knows he is far crueler and more deadly than her father could ever be. Ilse chooses to run from this life. Her choice will have devastating consequences and she will never be the same. 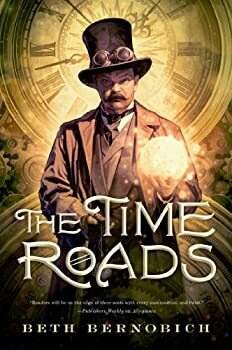 But she will meet Raul Kosenmark, a man of mystery who is the master of one of the land’s most notorious pleasure houses and who is, as Ilse discovers, a puppetmaster of a different sort altogether. Together they will embark on a journey that will reshape their world. Lush fantasy. Wild magic. Political intrigue and the games of seduction and treachery to gain control of a kingdom. PASSION PLAY is all of these and more. It is the journey of a woman who must conquer her passions in order to win all that she desires. 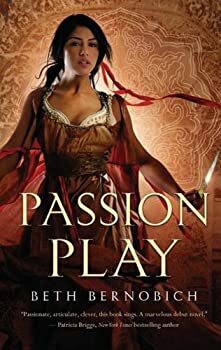 I was pleasantly surprised by how much I enjoyed Beth Bernobich's first book, Passion Play, a combination of having received it unasked-for and its romance-like cover. While it had its flaws, I found the main characters, Ilse and Kosenmark, intriguing and captivating both individually and with regard to their burgeoning relationship. In the end I gave it four stars and said in my review that I looked forward to its follow-up. 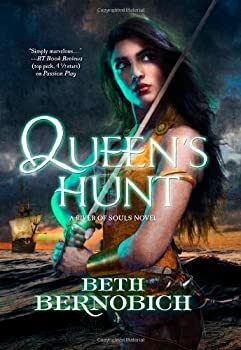 That sequel, Queen's Hunt, recently arrived in my mailbox — expected this time, but unfortunately, still a bit of a surprise upon reading as I found it a disappointing continuation of the story. The Long City — (2011) Young adult. Publisher: The king of Lóng City is dying. For Kai Zu, the news means more than it does for most former street rats in the small mountain stronghold, because he and the king’s daughter are close friends. Then the majestic ruler of the ghost dragons orders Kai to travel across the country to the Phoenix Empire, where the princess is learning statecraft. In a court filled with intrigue, Kai and his best (female) friend Yún must work together to help the princess escape and return to Lóng City. A refreshing mixture of magic, wit, and action, Fox and Phoenix is an auspicious debut! CLICK HERE FOR A COUPLE MORE TITLES BY BETH BERNOBICH.